The tomatoes had finally come into their own. The 6 plants of heirlooms and cherry tomatoes—one of my favorite was Mexican Midgit, along with Chocolate Cherry—had started to provide in August, but come early September, they hit their stride and just started churning out handful after handful. We've been having caprese salads, fresh slices, BLTs: but then we had even more and it was time to make something decadent. That's when the tart entered the picture. 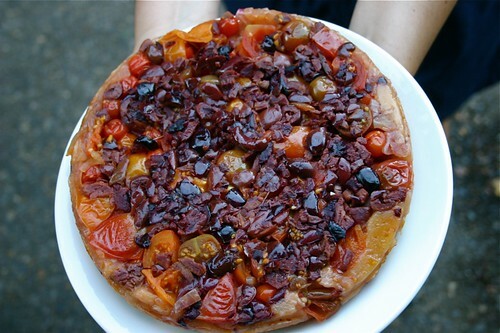 The secret to this tart is the tanginess of the vinegar in the caramelized onions and the salty olives, combined with the richness of the crust and the absolute gorgeous flavor of fresh-from-the-garden tomatoes. Go make this NOW and experience if for yourself. It's a keeper. 1. Preheat oven to 425. Make your pie crust (sans sugar). Roll out into a 10-inch round and place in your tart pan. 2. Melt butter in a large skillet over medium heat. Add onions and a pinch of sugar and cook, stirring, until onions are golden and caramelized (20 minutes). Add 2 T water and let cook off, scraping brown bits from bottom of pan. Transfer onions to a bowl. 3. In a clean, ovenproof 9-inch skillet, combine 1/4 cup sugar and 3 T water. Cook over medium heat, swirling pan gently (do not stir) until sugar melts and turns amber, 5 to 10 minutes. Add vinegar and swirl gently. 4. Sprinkle olives over caramel. Scatter tomatoes over olives, then sprinkle onions on. Season with thyme leaves, salt and pepper. Top with piecrust, tucking edges into pan. Cut vent on top of crust. 5. Bake tart until crust is golden, about 30 minutes. Let stand for 5 minutes, then run knife around pastry to loosen it from pan, and flip tart onto a serving platter. Cut into wedges and serve immediately. But why stop there? We had picked up some pears at a farm stand in Washington County and needed to use them. And along came the Caramelized Pear Tart. Pears are so mellow and just beg to take on the flavors around them. This is a lovely flavor combination and a nice bridge from the boldness of late summer to the warm comfort of autumn. 1. Peel, halve and core the pears. 2. In a 10-inch ovenproof skillet, heat butter over medium heat until foam subsides. Stir in sugar. 3. Arrange pears, cut sides up in the skillet. 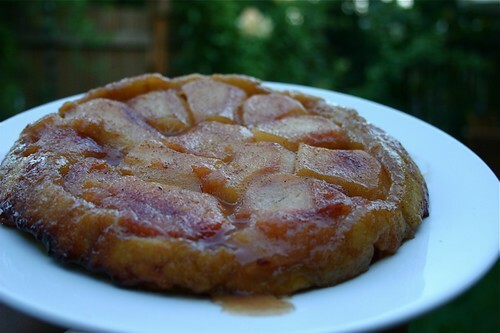 Sprinkle with cinnamon and cook without stirring until sugar forms a deep golden caramel. Remove from heat and let cool in skillet. 4. Roll out your pie crust into an 11 inch round and arrange over caramelized pears. Tuck in edges. 5. Bake at 425 for 30 minutes. 6. Remove from oven when golden brown and have your rimmed serving plate ready, because you're going to flip the whole thing. Wear oven mitts, keep the plate and skillet firmly pressed together, and just invert it. The tart will transfer to the plate and you will have a gorgeous tart. And that, my friends, is the Thursday Tale of Two Tarts. what a great and beautiful serving idea. 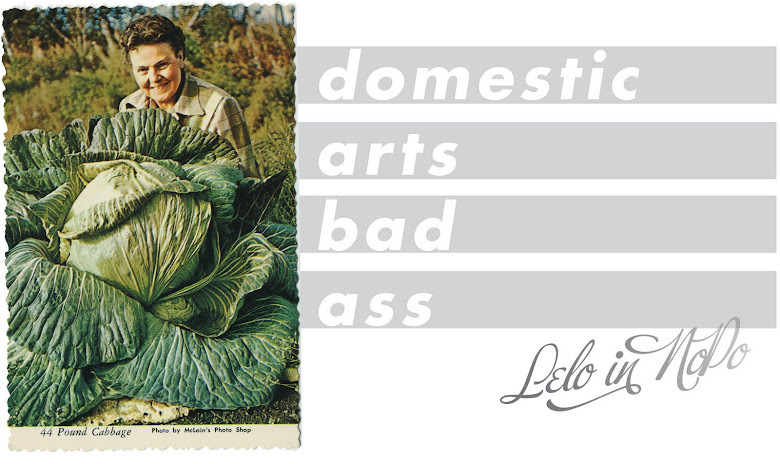 love you, lelo! Oh my gosh, your tomato tatin looks wonderful. Can't wait to try it. And I'm buying pears at the farmer's market tomorrow to make your pear tart. I enjoy your blog very much. Thanks. Wowwee!!!! Upside-down pear tart. I really want to try making that. What kind of pears did you use?